Lifetime Achievement Award Exhibition: James Rosenquist, which is part of the 2016 SGC International Printmaking Conference, will feature 30 James Rosenquist prints from several collections with the majority coming from the Jordan D. Schnitzer Family Foundation Collection. Giving an overview of Rosenquist’s works in print, the prints in the exhibition are drawn from the years 1964 through 2011 and include selections from each decade. This year’s SGCI Conference will honor James Rosenquist with a Lifetime Achievement Award. Rosenquist contributed to the renewal of printmaking in the United States when in 1965 he and a number of other artists explored the process of lithography at Universal Limited Art Editions. 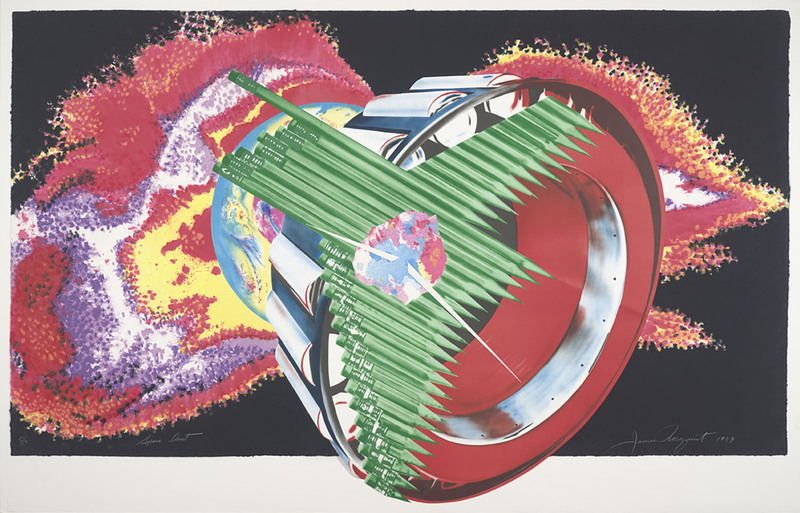 Rosenquist also experimented with screen prints and etchings, but primarily produced lithographs. Over the years, Rosenquist worked with Graphicstudio, Aeropress, Gemini G.E.L., Petersburg Press, Styria Studios, Tyler Graphics, Ltd., and Derriere L' Etoile Studio among others. Lifetime Achievement Award Exhibition: James Rosenquist is co-presented with the Jordan D. Schnitzer Family Foundation and the Pacific Northwest College of Art MFA in Print Media program. The 2016 SGC International Printmaking Conference, FLUX PORTLAND, is co-sponsored by PNCA’s MFA in Print Media and Printmaking programs and will take place March 30 – April 2, 2016 at The Portland Marriott Downtown Waterfront located at 1401 SW Naito Parkway in Portland. The conference keynote on Thursday, March 31 at 9am will feature special guests special guests Maurice Sanchez of Derriere L' Etoile Studio and James Reid of Gemini G.E.L. along with Jordan Schnitzer and Mack McFarland, Director of the Center for Contemporary Art & Culture who will discuss Rosenquist’s printmaking career. 66 1/2 x 105 1/4 in.